New York police determined that a moving truck abandoned on the Robert F. Kennedy Bridge did not pose a threat. New York (CNN) -- Authorities reopened the Robert F. Kennedy Bridge, formerly known as Triborough Bridge, early Thursday morning after determining that a moving truck abandoned on it did not pose a threat. Police closed off the bridge for about two and a half hours in both directions after being made aware of the incident around 10 p.m. Wednesday. The department's bomb squad was called to the scene after a toll booth operator who approached the U-Haul truck smelled a strong odor of gasoline, said Deputy Police Commissioner Paul Browne. Police X-rayed the truck, then examined it thoroughly -- including cutting a hole in the side of the truck to see whether it had an explosive device. "There's no explosive devices of any kind on any part of the vehicle," he said. Police will now move the truck to reopen the bridge to traffic. "When the bridge authority officer smelled the gasoline and saw the driver running from the vehicle, all traffic on the bridge was taken off and the bridge itself was closed in all directions," Browne said. The truck was headed to Manhattan from the Bronx when the driver abandoned it about 1,000 feet from a toll booth and ran off, witnesses told police. Browne described the driver as a man in dark clothing carrying a white bag. 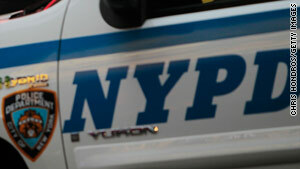 The city has been on edge since Saturday night, when a man unsuccessfully tried to set off a car bomb in Times Square.